Keep your look simple and fun! Quality full grain leather accents coupled with out-of-this-world capacity, this wallet will keep you stylish and organized with it's chic compact design! 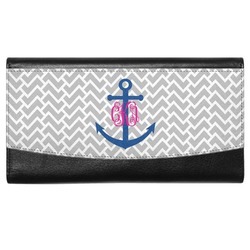 Perfect for travel, it can hold your many cards, cash, coins, checkbook, and much more! This spacious USA made wallet measures at approximately 7.5"W x 4.25"H x .75"D. There is plenty of room for everything you could need. The front of your wallet will be printed on a durable fabric, while the rest of the wallet is a beautiful black leather. You will find a secure snap closure on the front flap of your wallet and a gusseted zipper pocket on the back. Inside you will find 3 large slip pockets for a checkbook or bills, and also 12 credit card slots, one of which has a window for your ID. There's so much room in this wallet you won't believe it! To ensure your leather stays in mint condition, we recommend using a leather conditioner every so often to extend its life and keep its natural beauty. If the fabric area ever gets dirty, simply try lint rolling it, then try using a soft cloth with warm water and soap to gently wipe away any dirt. Go into our design center to get started on personalizing your wallet. Have fun picking out a background, ribbon, monogram, and frame that are totally you! Need help using our design center? We've got your back for anything you need! 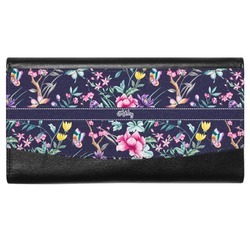 Find the perfect wallet in our Ladies' Wallets section. Now grab a purse to go with it! Our Purses and Handbags section has a great selection of fun purses like our classic tote and our huge hobo purse. You may also like our cute crossbody bag or our beach tote bag as well.